The park system has a number of facilities that can be rented. Water and electricity are provided at no additional charge. Our lodges include chairs and tables with the rental. Our pavilions include picnic tables. All rental rates listed on this website are subject to change. 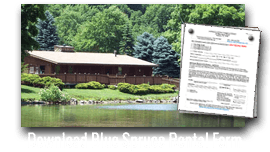 If you would like to rent an Indiana County Parks facility, please visit our reservations page. To rent a facility, first contact the parks office to check availability of the facility you would like to rent. 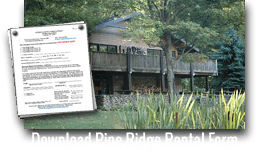 Once availability has been confirmed with the parks staff, complete either the Blue Spruce or Pine Ridge rental applications. View the complete listing of all rental facilities and the associated costs (PDF). For more information call our office at (724) 463-8636 or e-mail: indparks@gmail.com. If contacting us via e-mail, please provide your telephone number. You may print the either the Blue Spruce or the Pine Ridge rental application from this website, or one can be mailed to you. Please contact the parks office if you would like to receive an application via mail. We also have a credit card payment option. If you're using a credit card, please be sure to drop the application in the mail. Please see our reservations page for credit card payment options.